The Big Bang Theory is the scientific hypothesis of the creation of the universe in an almighty explosion. This event could not realistically happen purely by chance and would be more plausible if there was an indestructible force, a ‘creator’ present. ‘Something’ that is this unique and complex cannot simply occur by chance from ‘nothing’. In an analogy closer to our own frame of reference, it would almost be as illogical as to believe that something as complex as a fully functional computer microchip can form on its own out of sand… by chance. The Creation fits here as an indestructible form of pure energy. It would therefore be a spiritual collective ‘energy’ at one special moment… as ‘The One’… with all souls merged into it as one, creating everything with mere spiritual thought. Firstly… by virtue of The Creation creating an entire universe of stars with their orbital planets, one could say that The Creator is the whole universe, since The Creation permeates the whole universe. In a manner of speaking The Creation is made up of two parts: A body… the universe, and a soul… The Tree of Life. The Tree of Life is the collective force of an exotic energy state made up of an immense quantity of what scientists refer to as the ‘God particle’, which permeates the entire universe. Yes The Creation creates us in its image. We have a body. When analysed scientifically the body is a mini universe of atoms where billions of protons have in their orbit, trillions of orbital electrons, and the space between them is pure vacuum. We have a soul which is a small piece of individuality and in fact a macro part of The Creation itself. A perfect match so to speak. We are in the image of The Creation in this way, and we all hold a small piece of God within. The second interpretation of the biblical Genesis text will follow a little later. In an instant, all matter and antimatter from virtually nothing is created. Both matter and antimatter is spread outward and only that which has dispersed furthest away from its source, thus preventing cancelling out one another, forms galaxies of stars and many worlds, both in two different forms… one of matter and the other of antimatter. Both the star systems comprised of matter and those comprised of antimatter and that have worlds all seem to form within the same given blueprint design code set by The Creation. I define this code as a radiant life force, which I interpret as follows. There is most likely a radiating field - a ‘life force field’ so to speak – radiating throughout the universe. This ‘life force field’ is bathed in what appears to be a field of exotic elementary atomic particles that I believe fits with what scientists define as the so-called ‘God particle’ theory. This ‘life force field’ interconnects galaxies, and through stars connects to the planets associated with them. In other words, the way this ‘life force field’ works is like a radio signal interacting with all forming particles and their anti-particles, molecules and anti- molecules. A clue as to what defines the true ‘God Particle’: It needs to be one that is found in both matter and anti-matter and also permeates the vacuum of space. Sounds impossible? Time will tell. In the creation of biological life - the first amino acids form complex molecules - first algae, then bacteria, then more life follows. The life force radiating from The Creation places a life force within these simple forms until more complex creatures emerge following a set design plan. All creatures are given souls, although on a very basic level of consciousness. Over very long time periods of evolution, what takes place are small changes under an intelligent design code, as does natural selection, for any creature to be more perfect in its environment. The Creation finally brings into being the ultimate life form… a human-like creature that begins to make tools and use fire. The earliest intelligent beings emerge and appear to be given a ‘multi-layered’ soul that for the first time is more directly linking with The Creation. A good reference for the radiating life field is the Egyptian King Akhenaton who experienced some of The Creation truth and tried to depict it in his ancient murals. Akhenaton is well known in research circles of having very ‘alien’ looking features to say the least. Especially his unusual elongated skull. Images of him show our star (the Sun) radiating The Creation-linked life force with the Ankh - a ‘life’ entity symbol most likely representing the Cherubim/Grey entity - the protectors of all life (see angelic references much further on). Generally speaking, the Egyptian depiction appears to be quite accurate. Since by chance, it seems that the ultimate beings, The Cherubim from our universe of matter (not antimatter) were the first to explore space and were the first to find the physical place of The Creation at the centre of the universe - they were the first to be inspired by The Creation to build the Eden biosphere (of matter) to protect it. The Creation itself would no doubt value this kind of constructive intervention by advanced entities who would want to help improve the perfection of creation by creating a permanently radiating blueprint template (see ice statue blueprint template later) for more perfect life forms thus relying less on ‘natural selection’ in evolution. This would ensure that all life forms would become more efficient. Perhaps the most important aspect of such a more perfected Creation life force radiation is that competition between different species reaching perfect form on the same planet would be averted. For arguments sake if the perfect creature like the blueprint life code for the dolphin evolves to being able to stand upright and were to become intelligent, the radiating life force would in all likelihood prevent other creatures on that particular planet from developing any further evolutional changes to compete with it. Perhaps this explains why the most successful reptiles on earth like the crocodile have not evolved a single bit since the first appearance of the ape hominids. The Ultimate Destination to visit in the Cosmos. The Creation with its protective biosphere would also be a place of learning for life in the universe. All the souls of both matter and antimatter of the entire universe can be taken there in spirit form. However only physical life made of matter can be taken into the biosphere (made of matter) in physical form. As the universe begins to contract inwards in time due to super gravity (already seen in astronomy where galaxies collide and begin to create a ‘super gravity’) the universe will most likely contract and come to a big crunch. All souls will become a part of The Tree of Life once again before the rapid process occurs when the last few galaxies are locked in collisions hurtling towards The Tree of Life with all life forming as one… within The Creation. The biosphere around the Cosmic Tree would be destroyed in the process and another cycle of Creation begins in a new Big Bang. This is the cycle of Creation. For a long time The Tree of Life will be almost invisible again in as a vast more spread-out light. Its ‘tree’ form will hardly be recognisable until the first life finds it again, binds it and builds another biosphere to develop life and once again protect it from destructive beings. Traditional accounts of The Tree of Life are covered in the Biblical story of Adam and Eve in the books of Genesis and Revelation. One of the biggest mistakes found in Genesis text is the mention of the cosmic serpent. Unlike what most interpretations have led us to believe, Oneism wants to dispel that there is anything destructive about the reference to any serpent imagery in anything relating to the universe or The Creation. It was in all likelihood part of the detail of The Tree of Life itself, erroneously interpreted as an evil serpent. I have well-founded references to reason and prove that this ‘serpent’ was most likely a plasma-like ribbon of ethereal light that merely looks like a serpent, since it was made up of ‘living’ streams of light. The serpent like streamers of energy from The Tree of Life are of the same exotic particle make-up of The Tree of Life itself. Such a plasma ribbon from the tree would have allowed anyone touching it access to all knowledge … the symbolic ‘fruit’ of The Creation Tree of Life. Perhaps the advanced angel-like beings who have taken people from Earth to this beautiful place called Eden were warned that they were not ready to have access to the recorded knowledge of all good and evil, since their primitive warlike nature might take advantage of destructive knowledge. Perhaps what is written in Genesis does not refer to the first man and first women after all and it was recounting a multiple witness event of The Tree of Life by many human beings. The first clues come from the Hebrew text itself in early volumes of the Bible. “… man has become as one of US”. Here are four examples of the plural. None of them are saying that man should be created as an emulation of simply one person/one being/or one single Creator (as this text has been interpreted through time). This being the case, what is written is unlikely to be a misprint. There can only be one answer to this: It is the Eloheim speaking about the creation of man, and not The Creation itself speaking. The Eloheim are most likely Angels. In his book titled ‘Testament to the Truth’ - that now appears to be missing from circulation and libraries - the author Marcus Walker suggests that the Hebrew spoken word “Elo” translates as “people” and the word “Heim” translates as “heavens”. The two together most likely refer to ‘people that come from the heavens’. For more… see Adam and Eve under The Biblical Genesis text on the home page. It raises the possibility of chapters 1 and 2 of Genesis speaking of the human being, replacing Neanderthal (the hominid that was once destined to inherit the Earth), in an ‘all out invasion’ of our planet. Translated from early Hebrew as seen earlier, those Humans (Adam) that had been given ‘life’ (“Eve”) and who had ‘children’ (Hebrew spoken word “Cain”) were perhaps told by the advanced beings (Angels) and not by the Creation that they were not ready to interact and have access to all knowledge from The Tree of life since their nature was not at all like the lamb. In essence, there is a single omnipotent ‘grand designer’ Creator at the centre of the universe - and it is not likely to be a man. Instead it is likely to be an eternal light, and which the holy books of many belief systems tend to describe as something remarkable resembling a Cosmic “Tree”. Every time a civilisation in the past that had knowledge of the secrets of the soul, has created order, happiness and good life for all its people and after building great stone temples and pyramids, something would go wrong in a short space of time. I ascribe this slipping into chaos and war, to the greed of the ruling hierarchies and their determination to keep what they had been shown, such as the secrets of the pyramids, the secrets of the soul and The Creation, for their own personal gain. Some of these nations even went as far as sacrificing their own people based on the misnomer that this is what their Creator wanted from them. In later years, with later generations ruled by new kings and subject to strange new celestial visitations, things became even more confused. I believe that in isolated cases some destructive leaders of the past may have been targeted and influenced by destructive Cosmic visitors who want dominion over our earth’s resources and the enslaving of the masses. Mortal hands have throughout history manipulated its original testimonies of truth and thus manipulated society to gain obedience to its tyrannical leaders. Society has taught us to live in fear of a vengeful Creator when in truth one should live in honour of our gentle all forgiving Creator. Oneism fulfils the soul with purity and a gentle peaceful deep understanding of everything. Over the ages, society has justified discriminating against women and foreigners - that it is ‘good’ to conquer new lands, and more bizarre than anything else so far, that it is ‘okay’ to kill other innocent human beings by implementing the human law of ‘war’. Two of our biggest belief systems to date have text where one states that it is ‘okay’ to kill those that are not born in their land who do not follow their belief and the other that it is ‘good’ also to use foreign people for slavery. (Leviticus chapter 25 : 44-46). It is time to identify and search for clarity on what is right and what is wrong. Oneism will never be forced onto anyone. It is only for those seeking it. It is humbling, caring but more importantly more constructive in nature and more peace abiding than any traditional religion. It outlines what many will say is a more pure and perfect constructive way to find peace of mind and happiness while developing one’s soul towards purity. There is a theory that our planet is influenced by a ‘radiation’ field that could be affecting us in a destructive way. Many New Age proponents would say this is a ‘negative energy’ field - Something along the lines of renowned scientist Rupert Sheldrake’s theory of morphic resonance, but with a morphic field of absolute chaos. If this is true then what I am saying is that the radiating field of suffering on this planet is affecting others. I reason this against the probability that at present more than 80% of the world’s population is suffering in one way or another in our chaotic difficult existence, be it starvation, homelessness, stressful work, abusive people, and this suffering is affecting our consciousness. If this theory is true then all this suffering and anger is inducing a small amount of negativity or chaos into our own consciousness, perhaps clouding our thinking, even making us lean towards destructive tendencies. If this is real, it is however something a strong mind can overcome. A strong mind/soul can overcome this field of negativity with meditation and positive thinking. Especially if the soul/mind has developed to a level of meditation that allows it to differentiate clear thinking from the chaos, tapping into the ultimate source… divine intuition from The Tree of Life. Positive thinking is nothing new (contrary to what the latest craze, ‘The Secret’ seems to suggest). The real secret is to use positive thinking during deep meditation (see secrets of meditation) to role-play good, constructive goals to facilitate their manifestation into reality. Incidentally, making back-up plans when a specific goal is not reached is very wise as you need to maintain a level of responsibility for each step, turn or choice you make. It is therefore not ‘negative thinking’, or detrimental to your ‘power’ of positive thinking by working with back-up plans. For special goals involving the elevation of humanity, you may find that with great dedication and ongoing meditation, special guidance may come your way from The Creation. Invariably it is The Creation that will select the most appropriate timing for the execution of your higher purpose and may require patience on your part. If your higher purpose is humanitarian, stay with your purpose, for even if success is not immediate, when they do occur they will be immeasurably overwhelming. Since The Creation is an integral part of all existence, and the soul, a little piece of The Creation itself connects directly with The Creation, it most likely shares consciousness with all human life. If the majority of people are suffering on a daily basis on this planet in the kind of existence so prevalent today then The Creation is also suffering. This cannot continue at all … and a cataclysmic disaster will no doubt be imminent. How would The Creation end suffering if in all probability it cannot interact directly with us, say in the form of a miracle? Many religions expect far too much from our Creator, and completely overlook the best means of help we can receive from The Creation via divine intuition, whereby our souls receive guidance for our own lives and to help guide others, be it on a spiritual or physical level. More often than not people expect miracles to happen. People even expect God to make them rich. It is quite likely that The Creation can only interact with individuals in a much smaller way, even providing signs as guidance. For example, what we ‘expect’ from the Creator has to be manifested in the way we are living and our connection with The Creation. By developing the soul with constructive meditation and feeding the soul with learning and knowledge, we can begin to connect to our Creator in stronger ways. In time, there is a way one can learn to recognise divine intuition and unique signs. Seen from the ‘eyes’ of The Creator - outside help from other advanced beings would be seen to be destructive if interference is prolonging the agony of the majority of human suffering on this planet. Only The Creation can take souls from this world in a gentle manner in some sort of natural cataclysm. It is absolutely unquestionably destructive for any human being to interfere or harm the valuable life of another. What must be considered very seriously though is that we, as human beings, cannot take life extinguishing acts into our own hands in any way whatsoever. This is especially so with suicide. How disrespectful it must seem to our Creator for us to destroy our gift of life with the notion that as a consequence we would be given a better one. Statistics give shocking numbers. Someone somewhere is taking their own life every second of every day. To commit such an act would be at the peril of jeopardising the extraordinary rewards of the afterlife. Proponents of acts of suicide in the name of God are doing humanity the greatest of injustices, and what they stand for is invariably extremely far removed from the constructive traits of The Eden Principle. During your agony and suffering, find a place in nature that is quiet or if possible play gentle music (New Age-type music with no percussion as used on this website tends to be best). This is very soothing and healing as one gently falls into a meditative sleep to help heal your soul, especially just after a traumatic event. Visualise the Cosmic Tree and its splendour. When you awake you will begin to feel relief, with repeated action gradually allowing you to think clearer and on a heightened more optimistic level. Visualise the simplicity of life… many chaotic busy little creatures running around trying to find happiness and love… many passing through doors of opportunity… some with outcomes not exactly on a par with those envisioned. Now convince yourself of the simplicity of finding a new door to open… one with changes… wiping the slate clean… setting off in a new direction even if all you have are the clothes on your back. This is the path to take, instead of ending your valuable gift of life. As difficult as it may seem at the time, be brave and open a new door to life… awake… there are other ways out there, be it to find love or happiness. Believe that you are putting your past behind, as if in rebirth… you are precious, and worth more than what you have just endured! Consider how differently you would be able to start a second life if you were a new soul entering your body at this very moment without any knowledge of what you have already been through. It is important to try and erase your emotional pain. It can be turned off if you really want to turn it off. It is the power of your mind with prayer in meditation. You will be amazed how differently you will see everything. Suicide is never the answer… a door is waiting for you to a new beginning… in THIS life. In a perfect world, it would be constructive and harmonious for all populations across the globe to be able to understand one another with one language and one belief, and for us to be more circumspect about the display of our individual cultures and religions. However, reality has us heading in the complete opposite direction. Through time immemorial humanity has been celebrating its diversity in language, dress and culture, more often than not in front of those with different traditions and beliefs. It may seem harmless but subconsciously it creates a sense of difference rather than unity. Obviously when we travel we want to be enriched with the new and unfamiliar about other people, yet when these idiosyncrasies start to permeate our daily existence, for many of us they cause a very deep hidden discomfort and on a subconscious level less harmony. What if we were to keep those more obvious facets of tradition as a collective group to our home turf, so as to ensure and bring about greater harmony with all around us. If we were able to work towards this challenge, future generations could live in a world in which neither language, culture or tradition permeates they daily lives, and defines and segregates them from one another, allowing everybody a more harmonious co-existence. Nature IS pure Creation. It is the loving product of The Creator. Appreciate the beauty of nature and you are already in harmony with The Creator and have a wonderful afterlife to look forward to no matter what you believe. For example, let us say that a soul, after it has left this Earth carries a destructive habit tendency, in its next life, some of that habit (which is still prevalent) would be a threat to a place of paradise. Evolution appears to be the adjusting process of all species over time, working towards the fulfilment of a grand design human blueprint code, while naturally selecting and self diagnostically adjusting to their environment. There can only be one species per world that will achieve grand design. Perhaps natural selection in worlds that are hotter and warmer make perfect conditions for the reptile to flourish. In these worlds it is likely that the reptile will be the creature that reaches grand design. But in more perfect subtropical temperature worlds with beautiful Eden environments, the dolphin mammal seems to be, the most perfect gentle mammal that has the biggest chance for grand design. (see Cherubim Angel). In historical accounts here on Earth they appear to evolve into creatures that live on land and not in the sea. It seems that the dolphin lineage was one of the first land mammals on Earth 250 million years ago. However a cataclysmic event appeared to change conditions on Earth to be warmer. Because of this, the dolphin took refuge in the waters to escape the flourishing large reptiles that suddenly began to flourish. Around 60-million years ago another cataclysmic event altered the conditions on Earth yet again. This time to a cooler climate and the ape became the next ‘available’ creature destined for grand design. However, the Earth ape, the hominid, did not get his chance to inherit the Earth. For me, all indicators are that the ape was robbed of his destiny when his distant ‘cousins’ from another star system - modern human beings - invaded Earth. I believe it is highly probable that the moment one species reaches a stage of evolution where it is close to reaching grand design, then something happens to the radiating life force from The Tree of Life, and the evolutional development of all the other creatures in a specific world remains static. There is no question about it that evolution is measurable from small creatures, to ape, to hominid. However, what I contend is that the human species seems to have evolved somewhere else. It arrived here and took over this world, either by invasion or ‘universally acceptable’ fair replacement after Neanderthal perished in a natural cataclysm. All species also adjust to their environment through natural selection in a self-diagnostic process. An ancient lost religion of the Greeks called Neoplatonism by Plotinus and Porphyry once carried an invaluable truth about The Creator. It was they who recognised The Creation as the Cosmic Tree of Life and called it “The One”. Many will say that Oneism is merely a revived version of Neoplatonism. Although this may not be too far from the truth, the difference is that Oneism dissociates itself from aspects of Neoplatonism that are far from perfect. What Neoplatonism does however have in common with Oneism is the way in which it outlines human behavioural patterns in its time differentiating good from evil, and which Oneism has revived with more modern-day terminology. What is Heaven and Hell ? Hell - A world or any place here on Earth where we are incarnated as intelligent life. Worlds where intelligent life is treated as being of little value instead of being regarded as sacred. Places of chaos with dreadful climates, places with a prevalence of frightening predators, places of sickness… the list could be endless. They are places into which intelligent life is being born and hence are the places for the reincarnation of souls that previously did not fulfil the greatness of their potential. But each soul on re-incarnating into intelligent life has been wiped of its memory, so as to be given the chance for a fresh start. The soul takes on the intrinsic penchant towards good or evil of its parents as an inherent basic habit at birth. Heaven – The historical meaning is probably a general reference to worlds of incarnation out there in the heavens… the Cosmos. The age-old belief in Karma makes a lot of sense. Live well and do good deeds and your soul will be rewarded with peace and happiness. The old belief that the afterlife is only a spiritual realm needs to be re-evaluated and reasoned. Not only does the notion of a mere spiritual existence seem unlikely, it is also quite imperfect. Try to imagine a Creator surrounded by billions upon billions of passed souls. All these souls as spirits, pretty much like tiny flying ants at night around a street light after the first rains have set them into reproduction frenzy. Somehow this is not in tune with the blissful or peaceful perception of heaven we have been conditioned to look forward to. Yet, this is probably synonymous with how heaven would be if every soul had to spend the rest of eternity in a single place called ‘heaven’ with our Creator. Also imagine how life would feel in spirit form. Speaking as a witness and with reasoning, I believe that it would be unlikely that spirits would be endowed with all the sensations and stimuli that the physical form is endowed with for its sustenance and maintenance. The physical form can languor in the comfort of sleep, can savour the taste of good food, can revel in the physical act of love making and reproduction, can soak up knowledge and new experiences, can challenge its reasoning powers, all within the context of an ever changing physical reality. The human form is the ultimate vessel for experiencing the aforementioned pleasures, provided of course that it can get its environment and people into gear to make the changes outlined under the topic of a 30 year plan – the changes Earth so desperately needs for it to be paradise. Oneism endeavours to rectify something subliminal encoded within the earliest copies of the Old Testament. I am of the opinion that this valuable truth was only decipherable by hierarchies who would deliberately keep what they knew from the masses they controlled. Encoded, what is revealed is a secret ‘Demon’ and ‘Magi’ reference to sacred stars forming a cross in the heavens, the coordinates of the grouping of stars in the night sky that those who come from above (who were most likely our ancestors) originate from and hid in subliminal messages. Also see: Solomon Key. The same falsified destructive mythology of symbols seems evident as having been added to a human blueprint code. The grand design as seen at the top of the human trait pyramid images that follows below on this website. What is clearly shown is how the human blueprint code becomes a pentacle when the human form in the combination of a woman and a man is depicted upside down… in desecration of the sacred gift of life. 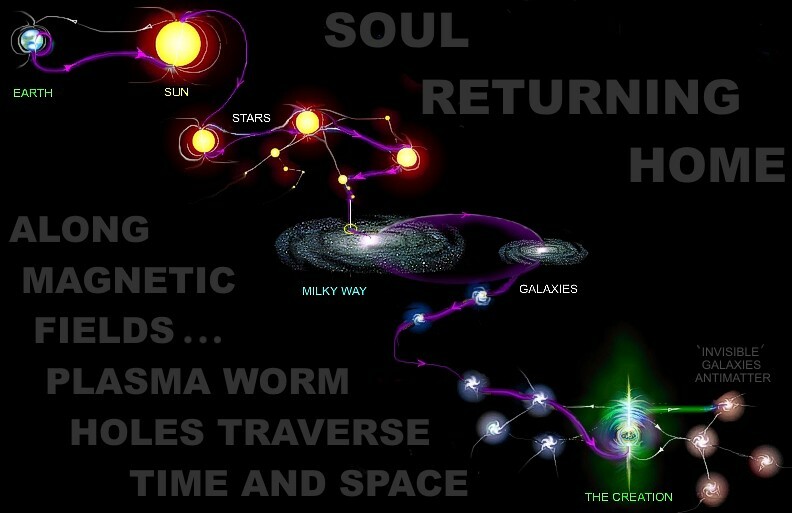 But most importantly, although the description of ribbons of plasma from The Tree of Life appears serpent like - and the technical device that binds The Tree of Life with rings, appear like coils of a serpent - it is NOT a serpent OR the devil OR anything destructive - it is part of the pure and wonderful Creation itself. Another situation that is an unfailing recipe for war is the apparent manipulation of two of the world’s largest religions by its earliest leaders. In all likelihood they felt compelled to ‘adapt’ what had been written in their holy books to justify war and dominion over foreigners, and satisfy their own interests. Oneism has great difficulty in identifying with religions that suppress equality and free thinking, especially those that set out to harm others who release studies on what was originally written in the ancient texts. It seems to call for sever action to be taken against that all those that do not follow it and convert to it. The biblical account of Leviticus Chapter 25 : 44-46 is an important account that needs to questioned in the same context. Something that simply cannot have originated from a Creator that created all of humanity. It condones the buying and selling of ‘foreigners’, including their wives and children, as slaves. In fact the only solution to this particular text is to consider having it completely removed. This is not an error of translation… and such a completely inhumane destructive directive could only have come from the human hand…. not from our Creator. The interpretations of The Creation I make here is being presented with a tone of the greatest respect possible to readers comfortable with what they believe, and are not designed to offend, merely to open the possibilities to new outlooks. Ancient texts all seem to suggest that The Creation visited our world. It would have been highly unlikely that The Creation would have been able to do this, while holding together the entire universe in order. It seems that how it would have connected to our world, would have been through prophets and mediums, and perhaps on a less conspicuous scale, visitations by beings not of this Earth. All visitations in the past are therefore most likely only references to ‘angelic’ beings, in other words, beings that visited our world of their own free will, who were actually able to fly with technology and more importantly wanted to teach us about The Creation. They have such advanced technology that to the ancients it would without doubt have seemed as though they were performing miracles. Now when reading the sacred books, if you have no outside constraints to prevent you from thinking freely with your God-given mind, rely on your wisdom to consider the marvel of these historical visits! They came in celestial ships and spoke of The One – the home of all life – the Tree of Life – the light at the nucleus of the universe - our omnipotent Creator. Is Oneism for you ? No one will ever force anyone to believe in what this website wants to share with the world. It is only for those that seek it. And there is no doubt that it will create discomfort for some. Change is difficult, new ideas often prove to be in contradiction of what we have believed for so long. And if your religion has made good, loving and caring people of you, The Creation is no doubt proud of these special lives (referred to as ones ‘book of life’ in biblical texts) and the seeds have already been sown for paradise in the next. These good people of other religion no doubt have the insight to see the good texts and have lived by them so there is absolutely no need to ‘change’ belief to Oneism… in a way you have already lived it without putting a name to it. But there will be those free thinkers among you who will want to break away from the outmoded romanticised traditional belief systems that place implicit trust in our holy books. After all, they have been rewritten over and over again by mere mortals. Even the seemingly most inconsequential among us, has been given the God-given gift of the mind. And we owe it to our minds, our soul, to look at the whole picture - to take into account the founding material of all religions, the accounts given worldwide of ancient paranormal events, and what the sciences have to say - so as to be able to compare the invaluable common ground that may be derived from them all. If we can become more open-minded at the very least and think for ourselves outside the box of the primitive and aggressive ways our traditional societies have instilled in us, then at least there is a shred of hope for us to start making the necessary changes for the way ahead. And further global suffering can be prevented. Oneism will be taking into account ancient paranormal events but more importantly, comparing and re-evaluating all the ‘commons’ with the study of modern paranormal accounts. Some modern-day encounter events will be referenced that are seen as consistent. Credible cases that stand out in obvious ways, with multiple witnesses or witnesses that have credibility by their status -testimonies of people who claim celestial visitation or contact with beings not of this world - will be compared with others that appear to be fabricated. The time has come to remove misguided tradition from our holy books. Tradition that has been altered so many times in history by the mortal human hand, by figureheads that subscribed to slavery, had very little education, they believed the world was flat. The belief that it was flat was so implicit that anyone daring to contradict this ‘fact’ would have been put to death in public. They would set them on fire! Any free thinker or researcher speaking of alternative interpretations of ancient manuscripts would be put to death as witches or demons. The collections today we call our religion, claim different meanings and in most cases oppose one another. There can be only one truth. Oneism is a belief system that aims to neutralise the differences and focus on the remarkable uplifting detail that is working its way to the truth and unity. This website will provide a base for it to begin. The first two images below are available as posters or wallpapers. Simply click on them to get to the link and then save them to your computer. The Biblical epic of Revelations has many lines describing the future visitation by a messenger riding a cloud that will uplift humanity. All the cryptic lines describing this event and what it represent are reconstructed here from copies of the Bible that were in circulation over a century ago. It also involves fitting the Matthew text of the three celestial Kings which 'follow' to the Bethlehem star. The text shown here is from editions of the Bible predating the year 1900. Scholars believed it was important to be changed! It reads in modern Biblical accounts now as a wheel INTERSECTING a wheel! How can this be allowed! 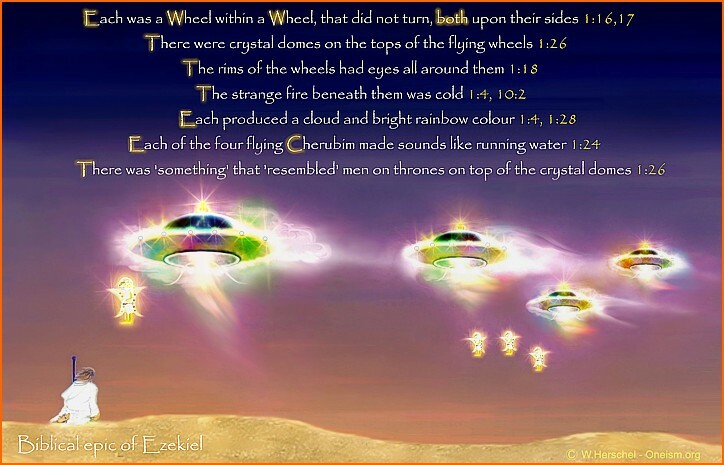 "There were crystal domes on the top of the flying wheels". 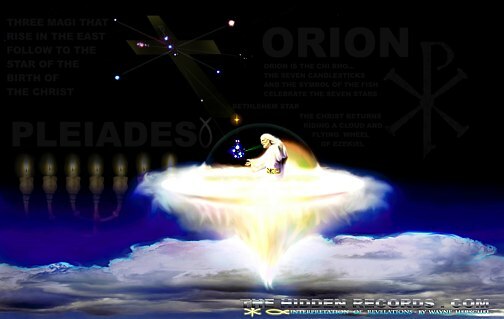 1:26 (firmament stretched forth over the beings heads). "The rims of the wheels had eyes all around them". 1:18 (The edge of the flying disc rim perhaps describing illuminated port holes as seen in modern sightings). "The strange fire beneath them was cold". 1:4, 10:2 (Common in modern sightings). "Each produced a cloud and bright rainbow colour" 1:4, 1:28 (Common in modern sightings). "Each of the four flying Cherubim made sounds like running water" 1:24 (Important ref to the same entities as my experience). "There was 'something' that 'resembled' MEN (plural) on thrones on top of the four crystal domes" 1:26 (cannot possibly be God if there were four of them, but more importantly it was a shape that merely 'resembled' a man!). The text shown on the Ezekiel Biblical epic image here is direct referencing of lines taken from copies of the Bible that were in circulation over a century ago. One has to question who and why the alteration was made in recent editions. The flying wheel within a wheel 'both' on their 'sides' is no longer a flying disc if it becomes a wheel INTERSECTING a wheel. 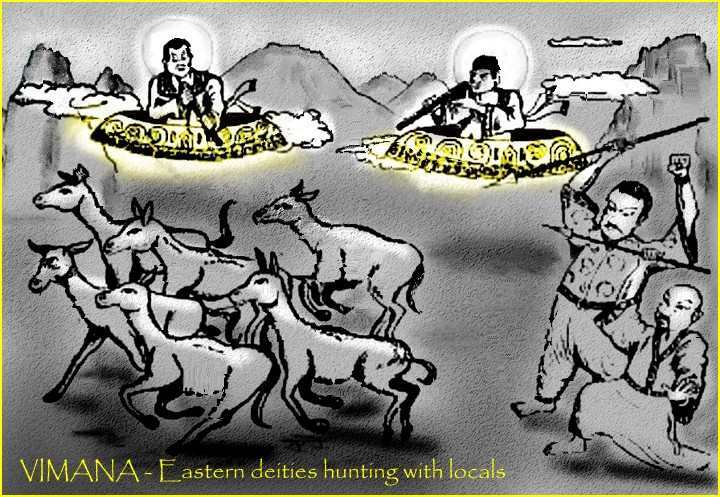 Do religious authorities have the right to change it to be different to the flying discs of Egypt or Sumer, or are they trying to make their holy account different to the flying discs of other holy books? Perhaps more importantly they are trying to make it different to what many believe is the ultimate cover up conspiracy theory: Worldwide governments agreeing to hide all records of a secret truth. ... the subject of UFO's. "The Pushpaka chariot that resembles the Sun and belongs to my brother was brought by the powerful Ravana; that aerial and excellent chariot going everywhere at will .... that chariot resembling a bright cloud in the sky ... and the King (Rama) got in, and the excellent chariot at the command of the Raghira, rose up into the higher atmosphere.'" The first thing one will realise with a little historical research is that most religious works have had some recent changes made compared to the earliest editions. “Who has dared to alter these sacred texts?” no doubt is the first question that will cross your lips. Why did they change the original sacred records you might ask? The bird wing teaching mechanism was convenient for a primitive people who could not conceptualise the notion of an angel, but the motivation for alterations and deletions behind much of what had been changed was way more damaging than this. Interfering with sacred texts could give these figureheads more control, allowing simplifications and misnomers to instil in the people a greater obedience and a fear of God. These leaders thus soon had full control of the resources of their unsuspecting subjects. There is and always has been one sacred place where meditation and prayer is initiated from. It is the human body… your own body. Meditation and prayer do not completely require a ‘holy’ building or temple of stone, although when studied for their architectural efficiency, I believe the original temples of the earliest ancient civilisations do amplify a spiritual connection to The Creation, and much more. Briefly, it would appear that the original pyramid-like design plan of high volumes of solid stone, as well as its location - invariably in close proximity to fault lines and running water - would enhance the spiritual connection to The Creation of the ‘initiate’ when inside it. Souls appear to return to The Tree of Life after each and every life span - they are judged for their ‘habit’ of constructive or destructive traits. Like goes with like, namely reincarnation in an ‘after’ life so to speak, as flesh and blood life and most likely not as traditional accounts will have us believe as an eternal spirit. According to such accounts consider billions of souls without a bodily form living together in heaven (in space) around The Creation. Most likely the only senses they would have would be sight and sound (dissociated from a physical body). The meaning of life – is life itself – it is a gift and should be cherished whilst striving to achieve peace and happiness, and your higher purpose, which only you are cognitive of. The Creation, because of its perfection, would NOT intrinsically want life for us to be a struggle, chaos, and submerged in suffering and worry. A ’30-year Plan’ of crucial changes is possible that can slowly evolve, elevating and enlightening all people from chaos and suffering, but only if the simple measurable truth of Oneism is spread. How or where we are reincarnated is to be determined, or in old-school language, judged. Those measured as been habitually gentle, loving, caring, in other words embracing harmonious living with everything that is naturally created (fellow human beings, flora, fauna, the environment), will most likely reincarnate into one of many other worlds of paradise in the universe. Those that have lived destructively and not in harmony with all Creation will most likely incarnate into worlds that are not perfect and in turmoil. The Creator is a real cosmic ‘anomaly’ of the science of astronomy so to speak at the centre of the universe - the place of the Big Bang Creation event. Laws of science are the grand design laws of The Creator and the ‘force’ referred to as The Creation. The soul is eternal - it is our consciousness and our mind. Every human life force carries a small piece of The Creation. Evolution is a factual science. Human beings did NOT transpire on Earth as a result of evolution on Earth. They evolved most likely in another star system and replaced Neanderthal, not because of evolution on Earth, but because they appeared on Earth as an arrival. As farfetched as this may sound, I have substantiating arguments for the arrival of humanity from elsewhere in the universe. Humanity is a descendant of those advanced people that came down from the heavens (who evolved somewhere else). A major cataclysm on Earth, causing the oceans to wash over the continents, reduced the survivors of this advanced group of people to hunters and gatherers. From here forward Oneism.org can be the foundation for a way ahead that evolves towards the truth with more and more amounting evidence. A new collaboration of knowledge will be established for the first time ever, where everyone can make their own contribution towards the collection of the truth. See link at the bottom of every page on this website. In this age of communication, the internet is the perfect tool for everyone to submit links to material they believe to be important. If you happen to be someone who believes with certainty that you have another piece of the puzzle, write a short account (less than 300 words) of your experience and submit it. Images – less than three at a time or it will be classified as spam. 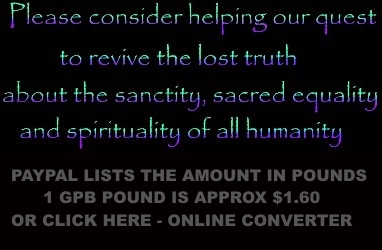 These new testimonies or links will be added as references as the site develops. Oneism.org will remain the responsibility of my quest until the moment it reaches a level where scholars are involved and after a council of at least seven wise responsible spiritual people are selected by me to protect it. It is inevitable that Oneism will come across resistance. There will always be an element that prefers us to be controlled and manipulated, and it will find ways to prevent us from thinking constructively and in harmony with nature for ourselves. The campaign for human rights has never been without resistance. There will always be those who prefer to maintain the status quo for their own ends, especially when it comes to further enriching and empowering themselves. If Oneism prevails, it will make it its mission to campaign for a fair distribution of wealth to bequeath that vast majority of the world population that has never had its human rights met, with some of that happiness and peace of mind every human being is deserving of. Interference and manipulation by a select privileged few has occurred throughout the ages, and that is why we have so many opposing belief systems, and truths that have been tampered with. This will not be allowed to happen to Oneism. There can only be one truth. Protective copyright action, as well as important back-up plans, are already in motion. There is a way that every individual can make a difference in promoting a more constructive way of living. If you believe in the importance of Oneism.org and you want to see a future with the constructive changes it foresees for the world, then you can help. The most valuable thing you can do is to spread the word to others… do it in an unobtrusive way that will not offend or upset the majority population in any way. If you want to make a difference, carry the Oneism logo (see bottom of page) on your website, or perhaps wear a button or even print T-shirts with the free logo. No doubt this will have a ripple effect with people subconsciously recognising the image and asking about it. If you are financially comfortable please consider being a part of the quest to help cover the costs of promoting an awareness of it with a donation (see bottom of page). As we all know, the cost of doing any promotional activity in any field can be quite substantial. Oneism will eventually be presented with much more detail as a book or DVD for those who can afford it, but the basics will be freely available to all right here. Preventing the poor and repressed from enjoying their gift of life is so destructive that we may find that soon we may all have to pay the price for this as The Creation will not let so much suffering continue. Every suffering soul is forcing The Creation to share some of the pain. I have been shown a simple way that the world can make important changes fast, if we want to save ourselves. However, this way needs to work its way by word of mouth or by letters to heads of state and governing bodies before any changes on a large scale will be attainable. I was shown in deep meditation that firstly a new super broard band internet of a completely different and independent streaming method will be possible. It will be completely independent from regular internet and will run parallel to the internet system. It will also have less chance of being tampered with. It will be freely accessible by all. This special internet will be only for learning and knowledge and new research. Every subject of study, every scholar’s syllabus, every piece of factual material in every subject including that of theoretical research will be included. It will be designed generally along the basis of Wikipedia but with far more graphic design and virtual reality imagery. It will be compiled by responsible special access editors and not the general public. The new type of internet will have sensitive monitoring for hacking. Secondly, the building of all syllabi of every subject from nursery school up to university will be presented in an audio-visual format, compiled by filmmakers in a whole new experience of learning. Compilations of very dynamic new entertaining presentations of all learning. In place of uninspiring classrooms and sometimes poorly trained or incompetent teachers - theatres of learning will be the norm with interactive keyboards for its students. Invigilators replace teachers who maintain order, monitor and evaluate students’ input. Fast learning, well-behaved students are separated from the slower learners, as the latter will need more hands-on teaching. Each student can interact with questions via their keyboards and work on projects with access to the footage they have seen on the screens and more. I was also shown that due to technology already available, this new learning method will cost a fraction of what education costs today. Once storage data banks of all learning are accessible to all it will be available and free to everyone anywhere in the world. It will begin in one single language that is chosen as the most developed first world language at its time of inception. It will be available first to children in their first grades as an experiment then once it is seen to work it will work its way forward right up to university level. I will promote this possibility of an educational project with every opportunity that arises and if possible, to generate funds for it. Oneism is an intellectual belief system offered to all who have the freedom to think for themselves. It is based on The Eden Principle where one can reason perfect Creation, what is good (CONSTRUCTIVE) against what is evil (DESTRUCTIVE). It values all of the most consistent testimonies recorded in the beginnings of all ancient paranormal events and modern accounts today now classified as Ufology. It upholds absolute peace and harmony of a vast universe designed by a single Creator to sustain the gift of physical life. It recognises that The Creator is an omnipotent spiritual nucleus at the centre of the universe, the original place of the Big Bang and it appears as a Cosmic Tree. This gentle belief system provides a solid foundation that will sustain ongoing updating adjustments making its way towards truth. The element of worship is replaced with honour, love and cherishing all that is created and the element of humility will be seen in a whole new light as a vital human trait in our fast moving world of distorted value systems. All of the above, and everything on this website The study of pyramids and temples, cosmic beings, soul development in advanced meditation using unique and simple techniques becoming more connected to The Creation to be enlightened and develop wisdom. The controversial videos seen below explore a lot of inconvenient truths. The second video introduces a path for hope for a Resource based economy and a future including most of the new human rights seen below. It introduces the concept Future by Design near the end of the second movie which is an absolute must to be seen. Some material in these videos might not be perfectly accurate but it will help viewers understand some fundamentals that are causing the suffering in this world. Many professional people have commented that these two shocking films have opened their eyes. To reach a balanced and sustained ‘green’ Earth, where all its resources are balanced with replenishment programs, its global population needs to attain zero population growth. The world is in crisis with an out of control population explosion. Ever watched a bacteria colony develop? It takes hours of cell division slowly growing from hundreds to thousands to tens of thousands then it reaches an ‘explosive point’. It seems like there is a sudden explosion of bacteria. Each cell divides, then two makes four, four makes eight, 16 makes 32… etc. Once over a certain volume the spread of the bacteria is absolutely devastating to what ever it is consuming. The world population is in the explosive growth point and it needs to stop. If not the suffering and chaos will destroy the world. World government needs to address undeveloped countries with some sort of incentive scheme because sadly it is here were unacceptable suffering occurs. Children are being born to parents that dont even have food or shelter themselves and in most cases cannot get access to effective contraception. Look at this link here to see the human population explosion. It measures live figures referring to a daily average. The figure is altering at a shocking rate every second! Ever heard of get rich ‘pyramid’ schemes where people use the scheme recruiting people to sell something and all you have to do to guarantee your earning is just sell ten of what ever scheme it is and you are on your way to riches. As one of your clients sells to another ten, then they sell to another ten, and so on and so forth… once it reaches past ten or so links you have seen those that have done it for a short while are earning a lot of money. The only problem with a ‘pyramid’ scheme (which is illegal in many countries) is that it ‘burns out’ very quickly and only the people at the top of the pyramid get to earn. Thousands of those in the middle and bottom of the pyramid lose! Modern society appears to have secretly evolved a monetary commercial system that can be compared to this destructive ‘pyramid’ scheme. Over the ages law has been manipulated to provide systems so the Elite can protect opulent profiteering. 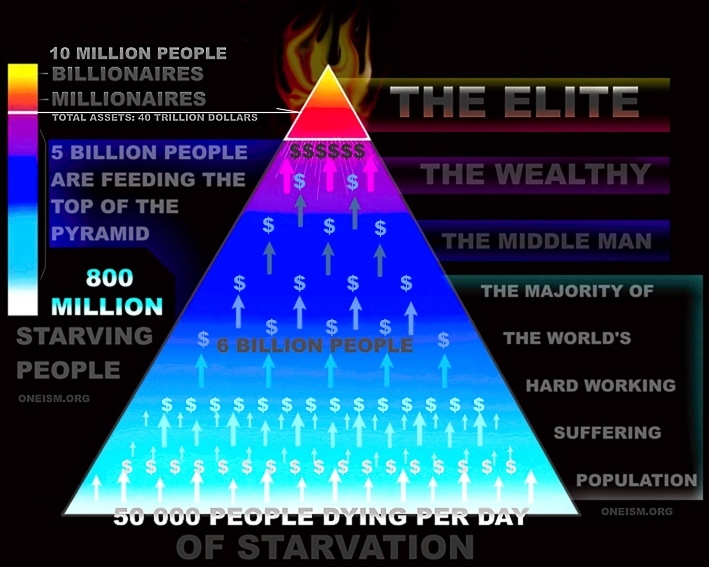 At the top of the ‘pyramid’ graphic in yellow and red … The Elite… manipulating law for greed billionaires are the 1% at the top of the pyramid. Latest statistics estimate a net worth of the Elite standing close to 40 Trillion US dollars shared amongst approximately 10 million people. A very tiny amount of the world population when compared to the total figure 6,7 billion people. It is important to recognise what I mean by ‘Elite’ in the graph above. This word will be used to highlight mainly those of extreme wealth who do NOTHING or very little to help humanity. People who take advantage of those in the pyramid illustration beneath them. Those of great wealth that have worked hard for their fortune while putting a LOT back into society that are less fortunate than themselves must be excluded from this category. People like Oprah Winfrey stand out amongst the rich that dedicate a percentage of her profit making a difference to uplift many out there. If all billionaires lived their lives in this way, the world would be a better place, even with the current opulent protected profiteering elite monetary system. How is it possible for so much money to be made by single individuals if you consider the billionaires of this world who have no charitable concerns. People who do NOTHING for humanity? Consider also the amount of work input per day for many Elite people and ponder on if you believe their daily earning is justifiable. An average day some say is spent with people they seek to profit from. A few signings... some hand shakes... and thats the days hard work. Is that fair? Is it okay for humanity and the world to allow this? Ponder on the thought. Now compare this to a hard working laborer, who most often is a victim of poverty whose parents could not afford a good education. This laborer for example, is working long back breaking suffering hours, and is rewarded with barely enough to prevent his family from suffering miserable lives. The only possible way the rich are getting so much richer is because there are billions of hard working people out there sustaining and feeding the top of the pyramid! See in the image above and how billions of people are sustaining the Elite. The ‘pyramid’ effect where the true profit originates from those below the top of the pyramid passing their dollars upward so to speak. Extreme profiteering and human manipulation for harer work, longer hours and less reward has to stop and no single person should be allowed to own so much in the far future. In order for this transition to be possible it must occur slowly. A period of thirty years will work. Anything shorter will create terrible circumstances where the elite will cause fake wars just to protect their empires. Consider now the 25000 people dying every day of hunger, and the 800 million suffering every day. This is unacceptable in The Creation’s eyes and has to stop! Let’s do an experiment: At least 1 billion of the population of the lowest part of the ‘pyramid’ in this world that are struggling and suffering in one way or another, not able to enjoy the fruits of life. Imagine if all the Elite suddenly decided for charitable reasons to reduced their status to net worth measured rather in millions of dollars per person in each family. Put the balance of funds into a big vault and spread its worth equally to 1 billion people who are suffering at the bottom of the ‘pyramid’. The amazing truth here is that each of the 1 billion of the repressed population would receive approximately $40 000 dollars! It is enough to sustain these people for a very long time with basic food and shelter. And that is just an example of individual wealth… What about every country’s financial reserves? One would imagine all the struggling world population could possibly be sustainable for a substantial period too. The solution to this problem is a Resource based economy once the Elite profits have been curbed. The world population is either close to or already over the number to be in harmony with all its natural resources. If we go too far over the number of people this Earth can sustain… we can guarantee ourselves a natural cataclysmic event. At this rate such a disaster seems inevitable when studying prophecy and our current destructive trends. for humanity to solve its greatest problems. If we cannot do this urgently, we are destined for another E.L.E.E. (Earth Life Extinction Event). Introduction of free education to be made available as soon as possible for all, implementing new internet and theatre of learning. (See learning and knowledge which follows). Usage of land and homes rights for ‘lower productive’ society - State controlled marriage rights introducing free usage of small piece of land and quality homes, perhaps starting with married couples; State housing of reputable quality becomes available and reused by new couples. Only a static growth population makes this ‘miracle’ possible. ‘Higher productivity’ society inherits more comfortable homes and larger pieces of land accordingly. The productive incentive is important. New homes replacing old perishable homes can be built less perishable, to last centuries with reinforced concrete. Free energy, electricity and water usage. Excessive usage billing only. Free medical and legal costs. Cars, appliances, electrical goods and computers must be designed to be less perishable. Our present profit oriented economy designs these goods to be perishable within a decade when in truth most can last many decades. Imperishable packaging must become perishable. An end to opulent earnings: Adjustment over a 30 year period to control opulent profiteering by the opulent minority. No person should be allowed to profit with millions without putting its surplus back into society. No person should be paid a pittance for hard work of any sort. It is destructive to make exceedingly high profit deals that have little real effort or without having human advantages included into them. These valuable people live and work in very hard difficult circumstances with little time spent with loved ones and consequently live lives with very little reward. This difficult struggle is ongoing for the majority of the world’s population, while there is minority that is living in opulence, some personally earning millions every year merely for shaking hands, signing a deal, acting in a film or winning a game playing with a ball. Ponder on how shocking this tragedy would appear to an outsider, advanced beings visiting this world… never mind the fact that our Creator sees it and feels it. What many need to consider is whether it is sinful to put a price on learning and knowledge! After all, It should be as free as the air that we breathe – something that elevates the individual to greatness and develops a nation. It is hard to believe that putting a price on specialist and advanced learning that only a few can afford can be justified. Millions right now are being deprived of access to great learning and sadly being attracted into destructive ways. After I was ‘shown’ how millions right now are being deprived of access to great learning and sadly being attracted into destructive ways – it has inspired me to start my own life project. If humanity could be seen to be genuinely involved in setting up a new system where all children across the globe can have access to free education. Imagine how this would appear to our Creator. Nothing could be more important or greater in such limited time that we have. Oneism is in the process of forming an 'organisation' for itself, to enable it to increase its research base and network (hence listed as .org). The idea is to accrue vast studies of 'lost' and 'hidden' knowledge, as well as work with new research that may be forthcoming in the future. Oneism, is a belief system that basis itself on ongoing input, ultimately working towards the parameters that comprise it, being deemed of academic status. The assertions Oneism makes are subject to a probability factor calculation. In time this will be a barometer proposed for all topics. Responsible for this will be a group decision panel of wise people to be referred to as the group of seven. For now, I propose some general probability figures for a few topics as a start. Oneism regards itself as the basis of a new spiritual consciousness - a 'second Renaissance' so to speak - that takes into account the common ground of all the sciences, theology, mythology and some spectacular new well-referenced revelations. In tune with the inner private and personal relationship with love of, respect for and honour towards The Creation that is already an integral part of so many people's consciousness, Oneism completely steers away from the archaic practice of 'prostrating' oneself in 'worship'. The history of prostrating oneself clearly shows that this practice probably has its roots in fear, where the gesture of breaking eye contact and bowing down indicates subservience to another. Would The Creator of this universe - the epitome of all intelligence - derive any value from being worshiped, or from submissive behaviour like prostration or genuflection on our part? The best way to reason how unlikely this scenario would serve any purpose is to compare it with a situation between a loving parent and child. What if, as a parent, your child was to consistently prostrate itself at your feet as a token of his love and adoration? It would at the very least invoke some level of discomfort. The perfect way that such an expression of emotion could be played out, would be for both parties to engage in loving and respectful mutual interaction, be it verbal or otherwise. Without my claim that it appears to be so, logic would suggest that the Creation would want its relationship with its 'children' to be a wonderful one where they live their gift of life constructively. Oneism is for open-minded free thinkers in search of more comprehensive explanations and diverse referencing for those searching for the hidden evidence of a perfect gentle Creator. The more gentle and pure textual references to our Creator appear to have been removed from the sacred texts... by human hand. Why? So that tyrannical leaders throughout history could instil in their subjects fear and obedience. Oneism proposes an alternative to spending time in traditional gatherings for prayer (in many cases repetitive religious verses). In place of this: Meditation with prayer in private - from one's sacred temple within - the human body - at no specific time - is the means by which we connect with our Creator. Oneism is unlike religion because it will never ever be a set belief system that remains the same for the centuries to come. This constantly updating study of our spirituality and the gift of the soul will continuously be referencing new material in the context of 'The Eden Principle' and through ongoing verification, will evolve towards a measurable truth. Oneism strives towards being seen in perfect harmony with science in the future. Oneism will, as far as is realistically possible, avoid the usage of traditional religious names and New Age names for valuable and sensitive spiritual material. This gesture is to avoid offence in view of readers of various religions, and to maintaining a more neutral and fresh stance. Oneism will soon provide a 'probability factor' measurement on significant findings under its scrutiny, and as more references become available. Unlike some 'static' traditional religions, it will strive towards more clarity with time. The probability factor will approximate the likelihood of specific findings being true as a percentage against the odds of them only being chance or coincidence. In the future, the group of seven will provide input, approached in an even more academic way. At this stage, probability factors have only been provided for a few of the prime topics. Prime topics: Tree of Life, Cherubim, Eden Principle, Good/Evil life traits, Knowledge -Food for the Soul, and Human Origins. See percentage probability listing sample here (in dark grey font to the right below each paragraph). The material that follows will be referenced against a wealth of forgotten historical evidence and more extensively later on as the site evolves. In this way it will meet much higher criteria as being 'measurable' with reasoning and logic. In most instances, references to recurrent historical accounts will be used to cross reference my findings and experiences in the context of all-important universal truths. ©Oneism - the rights of the material found on this website have been protected. As with any breakthrough that creates a new awakening, there will be those that will attempt to reproduce altered or false versions under the guise of 'Oneism', and probably ask a fee. If no link to such supposed proponents can be found on Oneism.org, their accuracy, objective and intention cannot be vouched for. Be weary if you are asked to pay a high price for anything relating to Oneism, or the evaluation of Oneism good and evil or the 'Eden Principle', to mention but a few of the original topics revealed on this site. If it is not the direct work of me, either in the form of a book, course, workshop, ebook then it is not Oneism in the context of all the parameters outlined here. I will only release DVD's soon and a book version much later, primarily for libraries. As far as is possible it will be available in full colour at the price of a regular black and white paperback, much in the way my current book is being distributed. Any proceeds there from over and above the publishing costs will go towards envisaged projects for free education for children. I hold the copyright for all the images on this website. They may be used in magazines provided permission has been obtained from me, but not in any published books. From my own unique experiences with the paranormal, I will try to reconceptualise as vividly as possible, what I have learnt about the way the soul perceives the universe in its journey to the Tree of Life. The technique in developing ones soul is ancient and has been called many things by different cultures. The most descriptive wider name for it is Enlightenment and The Buddha achieved it. Was it under a tree? This is an interesting question since some scholars have suggested the tree image behind the Buddha is representation that it was the Tree of Life that ties in with his enlightenment. A large tree most likely acts as a mild conduit assisting greater connectivity to The Creator although it is not easy sitting up against it. Perhaps it only works if the tree is on the top of the hill. To reach Enlightenment takes years of practice and it requires an inner passion for The Creation, its imagery and an element of self hypnosis. I had read that the human body needs to be as healthy as possible and free from toxins and having food being processed in the intestine or stomach. Note here: people that have drinking or smoking habits need to read the chapter that follows. near a river and fault line. Remember a little sacred rite poem. Write this down or print onto a piece of paper and read it at least 5 times a day. Read it with induced deep emotion and longing. For some mornings nothing will happen. Your subconscious is learning the rite. It will trigger one morning just as you are about to wake up and then your little rhyme will echo in your mind. As it does you will immediately see your retina is firing up with so many images that your heart will speed up in excitement. The art is to hold your heart as slow as possible or your body will wake up and the light veil fades! Trance like state is a necessary part of advanced meditation. Yes it can be induced artificially with drugs and exotic plants etc but the level of altered consciousness and thought interaction appears completely impaired or completely different judging by all reports documented. The trance like state achieved with primitive rituals in various tribal cultures using drugs of any form or by dancing ones way into a trance appears to be of little value in linking to ones Creator or in achieving interpretation of the detail received or linked to in the deep meditation trance. Since I do not smoke or take drugs I cannot speak from that point of view but I found from my own experience certain things prevented the clarity of vision or information received in meditation. I found that consuming any preservatives in food, alcohol and meat completely interfered with the clarity of deep meditation trance even if they occurred 12 hours before fasting. I also found that when suffering from allergies or with flu or having eaten badly for a long period of time also completely interfered with clarity of vision or information received in deep meditation. It is therefore my firm opinion that with bad eating, ill heath, smoking or drinking that one is very unlikely to experience the joy of advanced meditation or becoming completely enlightened. Please note that deep trance meditation is not a necessity of life. It is only for those that seek deep spiritual fulfilment. One can still receive general divine intuition based on the level of ones spiritual commitment and relationship with The Creation without meditation and without good heath or good diet. One simply needs to close ones eyes, lie back and relax and then commence with prayer. One does however need to learn how to look for signs in answer to your prayers. The most important evidence of the highest level of divine intuition in history would probably be The Christ, followed by The Buddha. Not only was The Christ more than just human having a father not of this world with higher genetic inheritance, his soul was one that most likely was of absolute pure of heart. It is likely that The Christ asked The Creation if he could come to this world to make urgent changes. In all probability even though he was probably born with all memory of his wisdom intact he would also have been told his future with the awful outcome of his murder that would necessitate future society remembering his word. Here The Creation spoke through and connected 100% with this wonderful human being. He was the most enlightened and illuminated to the extent that other spiritual people would probably be able to ‘see’ a glow of illumination as an aura around his head while he was teaching. I believe this was the level I occasionally reached. At times when I was most connected in deep meditation I felt the emotional connection and experienced vague misty visions while in a form of trance, mind awake body asleep. After years of practice in geologically special places it was as so, however most early mornings, a partial interactive connection is possible as the body awakens when not in a geologically special place. It is important to write down as soon as one gets up what one has experienced especially if it is related to information one is researching. In daily activity there are times when a clear idea manifests out of nowhere and with time one can recognise the difference between ones own ideas in thinking and a sudden slightly more emotional experience of an appearance of a linked source of information from The cosmic Tree of Life. In all probability ideas are not merely apparitions manifesting out of thin air. They can only realistically be explained as sourced from the ‘weak’ connection all people naturally have with The Creation… the source of all knowledge. This is how it is for all people, spiritual or not. The importance of identifying this link is crucial here since thousands of people today, all over the world that have had the benefit of experiencing a real emotional divine intuition event end up going completely in the wrong direction. For example the emotional realization that one has had a divine experience of the paranormal can completely change ones life. So much so that instead of further developing the connection (sadly from the lack of available knowledge in this subject), one obsesses in all sorts of ways to try and have more experiences. It manifests to a level where ones own fantasy becomes the source while trying to connect with many attempts in meditation. These people often believe one hundred percent that the fantasy manifestation is divine. Cases can vary from joining misleading cults, or even worse… starting a destructive profit making cult. namely… Us or Beings like us! The Tree of Life is The Creation – The Creation is neither man nor woman but an eternal pure spiritual/soul/plasma/exotic elementary particle-based energy radiating light - the home of all souls. The Creation has a biosphere constructed around it referred to in tradition as Eden. It was designed by the first advanced entities that discovered it. They are referred to historically as the Cherubim. From that day forward The Creation was protected by the most advanced life in the universe. It was primarily protected from destructive beings and destructive souls seeking knowledge for destructive purposes. All knowledge gained by every individual life form that has ever existed in the universe is shared and creates an ever expanding memory as a part of The Creation’s expanding knowledge. The traditional name given to these records are The Akashic Records. through its most dearly created life! In all probability, the most perfect gentle caring souls are incarnated and given life in worlds that are probably in galaxies in close proximity to the place of The Creation. Where our Galaxy is situated with regard to this ‘progression’ remains an as yet unanswered question. Perfection, happiness, peace and harmony - this is no doubt The Creator’s inherent passion. With constant ‘self-diagnostic’ alterations to the DNA of every life force design in the universe to suit its environment - (by natural selection), the evolution of all life adjusts towards perfection. In meditation the expression of love and gratitude is important. Asking for divine intuition is important too especially asking for receiving of signs for guidance. This is essential in achieve a happy and constructive life. Oneism does not require consistent ritual prayer. Meditation or communication with The Creation can occur when you feel inspired and through simple private expression in thought. Oneism does not require the individual to put aside a concerted time for prayer, meditation or communication with The Creation on a regular basis. How you conduct your daily life, your interaction with all that is ‘naturally’ created, be it your fellow human being or the environment… in fact all life… is your communication with The Creation, and can be as powerful, even more powerful than time and parameters set aside for formal prayer or meditation. If your daily life is in harmony with The Eden Principle then you ‘are One’ with your Creator. The soul carries the habits of ones nature, be it that of orderly constructive living or the opposite. This being the case, one can express this as good or bad ‘karma’. Living a good constructive life habit would no doubt earn an afterlife in which the soul will be even more connected to The Creator. The way in which The Creation seems to ‘reprocess’ every life after each passing, is simply to place ‘like’ souls with ‘like’ in their next gift of physical life - murderers with murderers, those with respect for the environment with others who have the same values, some in worlds/places of strife and struggle, others in worlds/places of paradise. Those that have lived lives that are not completely constructive, the memories of the previous existence are erased, and in each instance, a new chance is provided for the development of more perfected habits. It is quite likely that once a soul has lived a life that is very constructive, it not only earns paradise but retains the wisdom and all memory of the past life. Some contactees who claim to have interacted with advanced beings, say there are instances of souls who have lived constructive lives being bestowed the privilege of retaining their memory of their previous life. As per the norm or what our frame of reference tells us, is that we have no recollection of our previous lives. Is our Earth a place of paradise or not? Although there have no doubt been lives that have lived here near perfection over the ages the sad truth is that as far as history has shown and how statistics appear today, we are heading towards crisis. Our world is slipping very fast into one that would no doubt soon be classified as not paradise. It can be averted and the solution is presented under the topic 'New Human Rights' (click menu). For some, Buddhism and the basic writings of other Eastern religions will have some strong similarities with Oneism. However, it is worth reasoning whether prostrating ourselves regularly for lengthy periods of time, or alone in meditation for long periods of time, is what our gift of life was intended for. At some point or other we may all have wondered why The Creator or Angels would not simply come down to Earth to reveal themselves officially and provide with us the truth of what we need to change in our lives, so we can all live to our full potential in preparation for the afterlife. This seems to have happened in the past however the end result was not what was expected. Here is the reason: Imagine if such a visitation were to happen today. One would at first no doubt feel uncomfortable. Nobody finds it easy to change habits, especially changing ones belief with an element of compulsion. Many people will feel uncomfortable that they 'need' to make unplanned changes for a good after life. Here is why it would not work: Human nature is strange. The moment we are coerced into making unexpected changes to our habits, regardless of what it is, human nature has us feeling irritated, rebellious and uncomfortable. Especially if we are not 100 percent certain on the source of the information, we are invariably reluctant to take a risk. Oneism strives towards the attainment of happiness as a human right for all. Oneism will be seen to emphasize with clear reasoning the importance of the goal of promoting a way to improve constructive living, freedom and happiness as a human right for all of humanity. a micro-sized portion of shared consciousness with our Creator. The Creation lives within us all. all the suffering on our planet! It is of paramount importance that humanity finds a way to alleviate the suffering and misery of millions of people, gradually working towards change and a greater commitment towards human rights. Sadly it is very unlikely there will be some sort of miracle that could relieve the suffering of millions in a short space of time. Yes humanity can make some changes to relieve some suffering but the priority now must include working as fast as possible to Zero population growth so at least the future has some sort of chance. A new approach to human rights is only possible if we are all committed to working towards a 30-year plan... a plan that will bring into effect some very important changes here on Earth. Oneism’s approach to such a plan is covered on this website. It impresses on us that it needs a 30-year time parameter because if implemented any faster, war will be inevitable. The most groundbreaking issues that the plan addresses are Zero Population Growth and Free Education. Improved human rights are only possible if our population is in harmony with its resources and that the population is static. Something wonderful occurs with a zero population growth and this will make sense in a moment. In ancient Egypt, the symbolism of the all-seeing eye as The Creator is based on very valid reasoning and great wisdom. Freemasonry relies on the all-seeing eye symbolism as representative of the grand architect of the universe. This ‘secret’ is nothing new and only serves to add to one of the greatest truths this society seems to show ancient record of, namely that of humanity’s star origins as identified in the Solomon Key. Tracing board secret – An ancient star map? Since ‘like soul’ habits appear to reincarnate with others of like habits, there is a powerful mechanism whereby those that carry destructive life habits in particular can be rehabilitated. Once a soul who carries destructive habits is born into a community where other similarly destructive people are present, for argument’s sake abusive people, murderers and rapists - the child would grow up feeling innately uncomfortable when suddenly they are amongst people like their previous life habit that would exist now as a subconsious habit. They would suddenly now become more worried about being a victim. The person would in all likelihood begin to reform him/herself and make the corrective changes to his/her character so as not to become a victim... perhaps even become a peace maker. There seems to be a universal law that ‘classifies’ worlds as ‘hell’ if most of its environment conditions are not comfortable and especially if most of its inhabitants are destructive. One has to wonder if this world of ours has the chance for becoming a place of paradise and not completely lost as a world that becomes that of ‘hell’. What level of chaos such a world needs to reach to be classified as such, is not known. However, once a world is lost in this way I believe there is universal law that allows it to be pillaged by advanced space travellers, good and evil, for it resources. What they are apparently after, according to some contactees, are natural resources that their own worlds are depleted of. Worlds that are ‘heavenly’ and constructive places of harmonious coexistence are protected by The Cherubim perhaps under universal law so they are not ‘pillaged’ by outsiders. These are the places of incarnation for souls of gentle habit, who will spontaneously nurture and care for their paradise. Our world has been protected... but will we retain protection? Thats the big question. It appears that there is an ongoing celestial battle between good against evil for the dominion of worlds that are of the ‘in between’ - worlds that are on the verge of classification between ‘heavenly’ worlds, or ‘hell’ worlds. These worlds are targeted by destructive space travellers who try to influence people of power to create more chaos so their resources can be taken. Who are we and where do we come from... physically ? Talks: For anyone interested in planning potential talks with Wayne Herschel as the guest speaker please write to the email address below. Highly visual one-hour presentation, followed by question and answer session! Proceeds at the door to cover the organiser's fees, running costs of the event and speaker's travel/accommodation expenses. Links: Anyone wishing to add the Oneism logo to their website as a link is welcome to do so, or to use the logo for producing buttons for those keen to disseminate the findings, please click the icon below. on The Tree of Life"
Oneism at oneism.org explores the oneness of the human spirit with God and is not linked to oneism.com, oneism.net, oneness sites or any other site claiming Oneism. Oneness sites are now becoming global. There are many oneness claims differing from others. Some Oneness websites are also covering important similarities to this website so be especially aware of those charging expensive fees. Oneism.org provides evidence to prove global Spirituality with oneness and that UFO flying saucers, flying discs are the mythological heavenly chariots of the angels, alien beings, the Cherubim, the Greys. Oneism.org explores UFO paintings in caves, lost symbols, UFO images in early churches, UFO evidence in earliest writings, UFO references in the bible and other holy books, the most authentic photos of UFOs and more importantly soon to launch, a whole page devoted to UFOs over the ages. Be aware there are a lot of UFO sites using fake UFO images that make false UFO claims. Oneness claims made by the Federation of Light workers are not linked here. This website is linked to author Wayne Herschel - The Hidden Records and the lost symbol of the keyofsolomon.net website where the lost symbol is deciphered as the stars of Orion. The Lost Symbol is the name of Dan Browns new book.